UniMop® floor mops are manufactured using patented yarn technology to provide maximum cleaning efficiency. UniFirst industrial mop services help eliminate moisture and soiling from floors to keep them safe and attractive. Our UniMop wet mops feature synthetic yarns that are designed to pick up and hold more water than traditional cotton mops, and they're manufactured using antimicrobial fibers that help resist the growth of odor-causing bacteria, mold, and mildew. Our UniMop dry floor mops are dust mops manufactured using patented Synergy Twist yarns that won't fray or unravel, for mop heads boasting maximum cleaning efficiency. With regularly scheduled floor mop services from UniFirst, your soiled industrial mop heads are regularly picked up for professional mop cleaning services and replaced with hygienically clean ones, so you always have the appropriate number of fresh mops on hand when you need them. We also offer complete UniFirst floor mop rental services for microfiber mops. 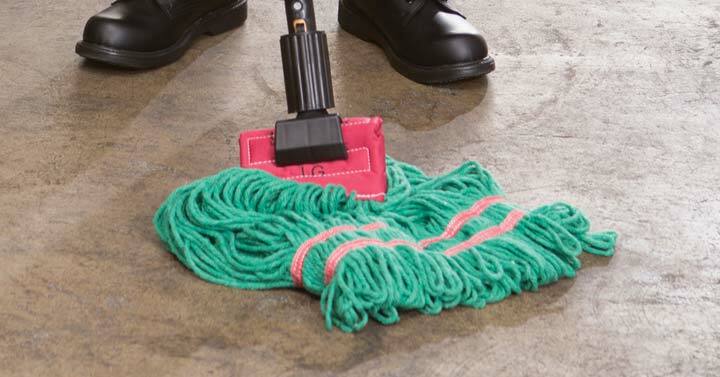 See our collection of mops and accessories in the UniFirst Facility Service Programs Catalog.